Leisha Kelly fans will thrill to see the unfolding love story of Frank and Sarah, a fitting conclusion to the Wortham and Hammond saga.Frank Hammond makes a wintry journey to make a new start in a fresh location, but all Sarah wants is to make a home as close as possible to the farms where they were raised. With their wedding date approaching, Sarah must come to terms with her doubts and misgivings while Frank finds that a gesture of kindness to strangers has opened a surprising door of renewed hope.Prior to her untimely death in 2011, Leisha Kelly was the author of several bestselling historical fiction books, including Julia's Hope, Emma's Gift, and Katie's Dream. She served many years on her local library board and was active in the ministries of her church. About "Country Road Chronicles #03: Sarah's Promise"
Frank Hammond makes a wintry journey of over two hundred miles to help his brother and look into a job offer he hopes will be the new beginning he is searching for. But all Sarah wants is to make a home as close as possible to the farms where they were raised. Why would Frank even consider moving so far away? As Frank strives to make a new start in a fresh location, he comes face-to-face with his own handicaps and a new-found call of God. 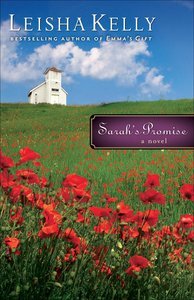 At the same time, Sarah struggles for the faith to fulfill her own promise to trust God, and Frank, no matter what the circumstances. With their wedding date approaching, Sarah must come to terms with her doubts and misgivings while Frank finds that a gesture of kindness to strangers has opened a surprising door of renewed hope. Leisha Kelly fans will thrill to see the unfolding love story of Frank and Sarah, a fitting conclusion to the Wortham and Hammond saga.